President George H.W. 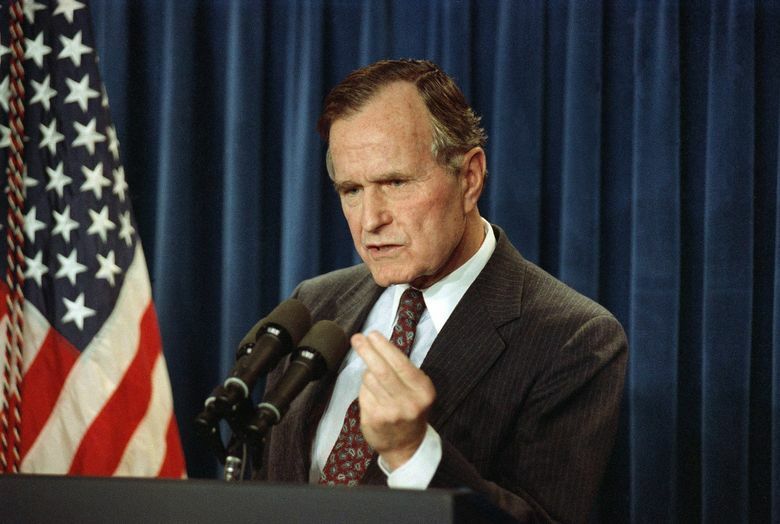 Bush gestures during a news conference at the White House. The 41st president didn't "feel your pain," but the economy cruised fairly well during his term — and anticipated today's controversies. Bush had the misfortune to face a short but painful recession later in his term. Unemployment peaked at 7.8 percent in June 1992. That was mild compared with the 10.8 percent joblessness in 1982 during the “Reagan recession,” but it was enough to wound a president who lacked his main opponent’s “I feel your pain” public empathy. The savings and loan scandal also damaged Bush. With the failure of 1,000 thrifts beginning in 1989, it was the most significant financial collapse since the Great Depression. Although the long-term costs to the economy and taxpayers were relatively light, the stink of political favors for an antiquated industry didn’t sit well with voters. The Democratic House Speaker Jim Wright was a casualty (replaced by Washington’s Tom Foley), partly because of his closeness to the industry. But the scandal also reached Bush. The president’s son Neil was a director of Denver’s Silverado Savings and Loan, and was ensnared in that institution’s failure. These economic events, along with the insurgent candidacy of Texas businessman H. Ross Perot, doomed the first President Bush in 1992. Yet much of Bush’s term saw an economy cruising well, while foreshadowing some flashpoints of today. Even with the painful mergers and restructurings of the 1980s, the American economy was much more balanced than it is today. One example is how the so-called Rust Belt had smartly retooled and reinvested, regaining its competitive footing. When Bush took office in January 1989, the nation had more than 18 million manufacturing jobs (compared with 12.8 million this past October). While this was before tech became part of everything, the relatively new high-technology sectors were starting to assert themselves. The groves and canneries of the Valley of Heart’s Delight were steadily giving way to Silicon Valley office parks. Microsoft had gone public in 1986 and introduced its earliest suite of Office productivity applications in 1989. Seattle was a city that many now fondly remember, with a heavy dependence on Boeing and deep roots in such sectors as small-scale manufacturing, shipbuilding, food processing and railroads. It was a middle-class town with distinctive neighborhoods. Washington Mutual was a sober survivor of the S&L crisis. Downtown, the Bon Marche still stood under its own name, although mergers had placed it under Federated Department Stores’ umbrella. But beloved Frederick & Nelson was in trouble. Soon the central core would have to pull off one of its periodic reinventions. Change had already begun with the controversial 76-story Columbia Center. George H.W. Bush’s term coincided with the early years of the “Great Moderation,” characterized by decent growth, low inflation and short, modest recessions. This era was overseen, or so it appeared, by the wise Alan Greenspan as chairman of the Federal Reserve. The deregulation and repeal of Glass-Steagall that would detonate during the second term of Bush’s son was unimagined outside the fantasies of bankers and libertarians. The United States was still the world’s largest exporter and trading nation. As a result, Bush could make the case that continued work toward lower trade barriers was in the national interest. He continued the Uruguay round of the General Agreement on Tariffs and Trade, involving 123 countries, a precursor of today’s World Trade Organization. He also continued expanding trade and ties with China — Bush had served as envoy to Beijing in the 1970s. This was pulled back somewhat after the brutal repression of demonstrators in Tiananmen Square in 1989, but soon resumed. In the late 1980s, China was a developing economy and hopes were high in the West that a liberalizing economy would lead to political liberalization. Many experts were much more concerned about competition from Japan. Hard to believe now, but Russia’s leadership wanted to use shock therapy after the collapse of the Soviet Union to create a market economy and align closely with the West. Most significantly, Bush championed the North American Free Trade Agreement, which would be completed by his successor. Perot, with his charts and staccato twang, famously opposed NAFTA, warning that the agreement would create a “giant sucking sound” as it destroyed American jobs. The best assessments of NAFTA indicate that it mostly rearranged jobs; some were lost, others were created. But the quote stuck. Nearly two decades of disruption, inequality and, for many, stagnant wages helped give Donald Trump a battle cry in his campaign against “neoliberal elites” — people exemplified by the first President Bush. Most of the appeal of Trump was white majoritarianism and cultural grievances. But Trump has made quick work of disabling American leadership of the liberal world order. It’s not prudent, but here we are.